the act of committing money (or capital) to an endeavour with the expectation of obtaining an additional income or profit. I invest so i don't spend it today, i stand to get more to spend in future. Is AirAsia's Travel Insurance worth buying?? TUNE PROTECT is brand name for Tune Insurance Malaysia Berhad. A sister company of AirAsia. When you buy air tickets from AirAsia.com likely you can just sign up for Travel Insurance with a "tick" only. In the past, we did a comparison, the coverage is not worth the price. However, in 2017, it has changed. You should buy TRAVEL INSURANCE, regardless Domestic Flight or International Flight. Click here to BUY and get a 25% discount. SME, are you well protected? There are five (5) main category for SME Insurance. Average of RM400 million in fire claims is incurred every year, industry wide. SME insurance provide SME an Immediate Fund Relief upon coverage confirmation, up to 50% provisions for working funds of the agreed estimate in the event of a major claim. What are the MOST COMMON SME Claims? Damage to insured glass and signage. Still not sure what is SME INSURANCE? protects property against loss or damage by fire, lightning and domestic gas explosion. covers indirect loss proximately caused by fire such as heat damage, smoke damage, water damage by the fire brigade and losses incurred in attempting to check the spread of fire or to save the property. Provides coverage against loss of profits or revenue, as a result of interruption in business operations due to fire or any perils insured under the Fire Section. Provides protection for all risk (direct physical loss and/or damage) due to accidental external causes to equipment, plant and machinery. Perils that are covered in the fire policy. Protects property against loss or damage due to burglary or robbery whilst contained within the premises. Visible marks or physical damage to the exterior of the premises made by tools, explosives, electricity, chemical etc must exist. Robbery - cover the insured property against violence inflicted upon the insured or by putting the insured person in fear of violence. Provide protection against loss of money/securities as a result of burglary or robbery. Safe burglary - to pay for loss of money and securities from within the vault or locked safe or locked cash register or locked drawer or locked steel cabinet by burglary or attempt thereat. Provide coverage for breakage of glass/signboard or by chemicals accidentally or maliciously applied. payment of installing temporary plates. payment of removing or replacing any obstructions other than window displays when necessary in replacing such damaged glass, lettering or ornamentation. UBB Cash Trust and Rockwills's Declaration of Trust are the example of how Trust can be creatively used as a "product" to solve financial problem, i.e. how to protect your asset and distribute it fast accordingly to your wishes. In order to setup a Trust Company, one have to get approval from SSM, and Bank Negara. Governed under Trustee Act 1949 (Revised 1978), a Legal / Legitimate way for financial planning. Assets can be hold by a TRUST including CASH, Property, Shares etc. (ii) there be erected on the land to which such title relates houses or other buildings the gross rental whereof, together with the land appurtenant thereto, is at the time of such investment not less than seven per centum of the purchase price of the land, in the case of the purchase price, or of the value of such land, as ascertained under paragraph 12(1)(a), in the case of a charge. View The Trustee Act 1949 here. A lot of people do not consider wear and tear as their own to bear. The legal principle of indemnity states that insurers will put the insured in the same position as he was immediately before his loss. If one’s vehicle is 10 years old, wear and tear would have taken its toll whether you like it or not. Therefore, if there is a loss, since the workshops cannot readily source and give you a 10-yearold part, a new part will be the next best choice. But, relying on the principle of indemnity, the insured benefits from this new part and so he has to pay for the betterment aspect. Note that betterment is only applied to the part that is replaced and not to the workmanship charges. 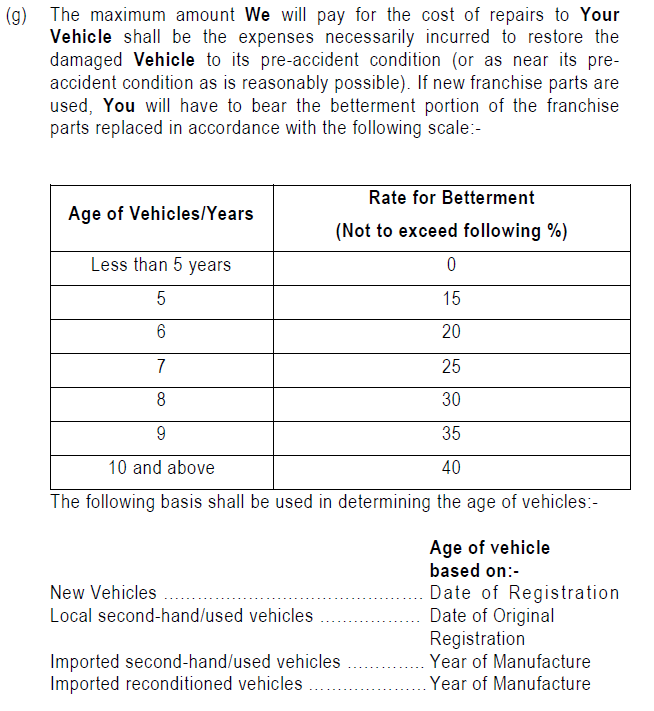 Below is the Standard Betterment Table, base on age of vehicle. WE refer to the letters “Baffled by insurance coverage rule” (The Star, Aug 20), “It pays to understand insurance” (The Star, Aug 25), “Make changes to benefit the consumers” (The Star, Aug 27) and “Motor insurance policy 101” (The Star, Aug 28). Persatuan Insurans Am Malaysia (PIAM) welcomes the comments of the writers and would like to clarify some of the issues highlighted. As rightly pointed, the basis of a claim is to put the owner in the same condition as he would have been in before the accident occurred. Betterment will apply when in the course of repairing an accident-damaged vehicle, a new franchise part is used to replace an old part. It will be based on a scale of betterment adopted by the insurance industry. For vehicles above five (5) years, the rate of betterment ranges from 15% to a maximum limit of 40% for vehicles of 10 years and above. Conceptually, betterment will be taken into account if new parts are used to replace the damaged parts as the vehicle will be in a better condition after the repairs than it was before the accident. Of course, if reconditioned parts are used, then “betterment” will not apply. If the owner does not agree to pay for his “betterment” factor, then he will have to wait for the workshop to source for reconditioned or second-hand spare parts. Availability of spare parts depends on the market and insurance companies have no control over it, especially where the vehicle is an old or special model. It appears that “More Than Frustrated” has been communicating with the workshop rather than with the insurance company involved and may therefore be getting incomplete information. PIAM advises the writer to contact his insurance company directly. Alternatively he can call the Accident Assist Call Centre at 1300 22 1188 or contact PIAM at 032274 7399 or pic@piam.org.my for assistance. PIAM would like to advise policyholders with comprehensive motor policies to submit their own damage knock-for-knock (KfK) claims to their respective insurance companies if third parties are clearly at fault. This will expedite claims processing, similar to own damage claims, as the workshops are in the insurance companies’ panel. In such cases, the policyholders’ no claim discount (NCD) entitlements will not be affected. With regards to determining the sum insured value under a comprehensive motor policy as raised by “Overcharged Customer”, insurance companies are required to advise consumers during the pre-contractual stage or renewal of motor policies on the market value of a vehicle based on a credible motor vehicle valuation database. This was one of the initiatives implemented by Bank Negara Malaysia in 2011 to reduce the subjectivity in determining the market value of a vehicle and enhance consumer protection. Insurance companies are also required to educate consumers on the importance of insuring the vehicle at the appropriate market value and the effect of over-insurance and under-insurance when a claim is made. If the market value of a vehicle at the time of loss is higher than the sum insured by more than 10%, the insured would need to bear a portion of the loss in proportion to the under-insurance. On the other hand, it would be a waste of money to over-insure as the insurance company would not pay more than the market value. Prior to the purchase or renewal of insurance, consumers may wish to obtain a free estimate of the market value of their vehicle at www.mycarinfo.com.my. This is a one-stop site that furnishes you with information about your vehicle. Policyholders are advised to read the terms and conditions of their motor policy carefully so that they are fully aware of their insurance cover and what they can claim in the event of an accident. Relevant consumer information on Useful Guide and Motor Accident, etc. are readily available on PIAM’s web-site www.piam.org.my.